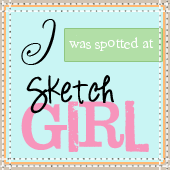 what else can you say when you discover that you are not only the random winner of a 10$ certificate from Softpencil Digital Stamps but your card has also been picked as TOP 3 at Sketch Girl. Thanks to everyone to has visited me, left comments, inspired me to create, followed me!! I feel truly blessed!! Happy Friday to everyone out there!! Quick post to share another card using the CPS #168 and the Embellish Butterflies Color Challenge. QUILLING !! yes its true... I don't know for how long I have been following all the sites with little or more information on quilling but couldn't come to try it out. This time I finally did it :) It isn't very great but at least I gathered some courage to try. I guess I am :)) because I received theses Jenni Bowlin goodies today that Kathy from Digital Doodles sent me. And I have fallen in love with these red vintage buttons and butterflies. They are sooo cute. Thanks a ton Kathy!! I went green again with this card(not literally..lol) and used newspaper and bottle corks. I used pearls for the first time and loved the effect!! Hope you all are good and happy!! I know I have been missing from the blog-land for over a week but then I had so much going on around. I will share the details of what I have been up to a little later :) As of now I want to share a simple card I made for CPS sketch #167 . I have cased one of Joanne's card from Mainly Flowers. I just love her cards and paper flowers. I recently received my craft supplies from itsy bitsy which included these metallic paper flowers and I used some basic grey brads to complete the flowers. I also want to put it for Papertake Weekly Challenge (Say it flowers). Today I want to share my GD card for Challenge Up Your Life. The challenge for the next 2 weeks is to use a resist technique and I really found it interesting. For my card I used the Crayon Resist Technique and I used it to color the flowers on my card. The center of the flowers was first filled in with crayons and then I inked up the flower(freebie from MARJORIE) using sponge. The crayon filled part resisted the color. I did the same with leaves. (enlarge to see details). Again I used my favorite PP and that is newspaper...lol. The image is from a site I discovered recently (will post the link soon). I made the roses with satin ribbon. I didn't want to add too much embellishment and spoil the picture so just kept it simple.